So there we all are at the airport. JFK has a swanky newish terminal which is conveniently located about ten thousand miles from baggage claim. Oh, and the Seattle flights come in at the very end of the terminal. A cheerful man in an eight seater golf cart must have sensed our despair, and offered us a ride to our bags. Grateful and frankly, exhausted, we piled on. A man we did not know was riding shotgun. But like the Little Engine That Couldn’t under the glare of fluorescent lights, the cart could not get up the tiny little airport ramps. The driver started the engine one, two, six times. Each time we felt the sad little cart roll backwards down the ramp. And then puff puff, chug chug, that little cart got up the bumps and onto flatter ground. I swear I think Fiona snorted. I thought M might lose his mind. We aren’t supposed to be watching Peppa Pig anymore because it’s not nice to fat shame your daddy. It’s especially not nice to fat shame your daddy after he’s tended to your every need on a cross country flight. It’s especially not nice to fat shame your daddy after you’ve spilled apple juice all over his trousers and laptop. 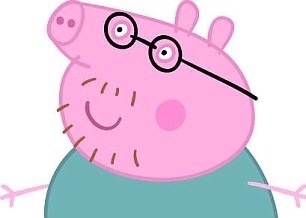 No more Peppa. This time I really mean it.